AllegroMedical.com presents The BHU Foods BHU FIT BHU Fit Primal Protein - Dark Chocolate Coconut Almond Protein Bar Gluten Free. 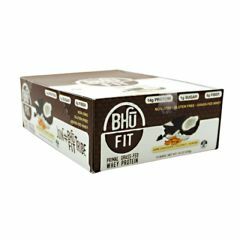 BHU Fit, Non-GMO, Gluten Free, Grass Fed Whey, 14g Protein, 1g Sugar. 8g Fiber, Our Little Company Grew Out Of A Casual Conversation Among Friends - Sweets Loving, Weight Watching, Trying To Eat Healthy Friends Conjuring Up Our Personal Version Of Food Utopia. The Conversation Boiled Down To These "What If" Questions:...It Were Possible To Have Great Tasting Desserts Or Bars That Contained Ingredients That Were Not Only, Not Bad For You But Were Actually Healthy Super-Foods?... We Could Make Guilt Free Dessert Or Bars That Not Only Didn't Compromise Taste Or Nutrition, But Actually Made You Feel Like You Were Doing Something Great For Your Body?...These Desserts Were Not Just Super-Healthy And Tasty But They Were Also Low In Carbs And Sugar To Help People Manage Their Weight? But Wait A Minute.. What If This Wasn't Just Idle Idealization? What If We Could Really Create This Here And Now On Earth? Why Not Try. And So The Adventure And Fun Began. Over A Year Of Tasting And Yummy Tasting Alter, Our BHU Was Born. We Hope You Have As Much Fun Eating Our Offerings As We Had Creating Them! Whey Protein (Grass Fed), Organic Prebiotic Fiber (From Tapioca), Organic Sunflower Seeds, Organic Chocolate, Organic Almonds, Organic Coconut, Organic Chocolate Chips, Organic Brownie Chunks, Organic Palm Oil (Certified Sustainable), Water, Sunflower Lecithin, Organic Cocoa Powder, Organic Coconut Extract, Organic Coconut Oil, Organic Vanilla, Monk Fruit, Sea Salt.